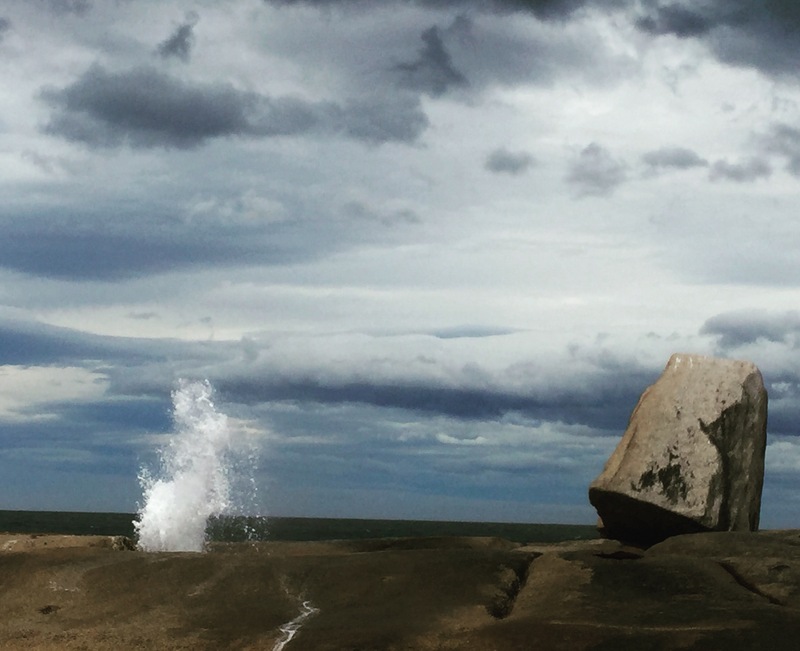 As predicted, it rained for a lot of our second day in Tasmania. 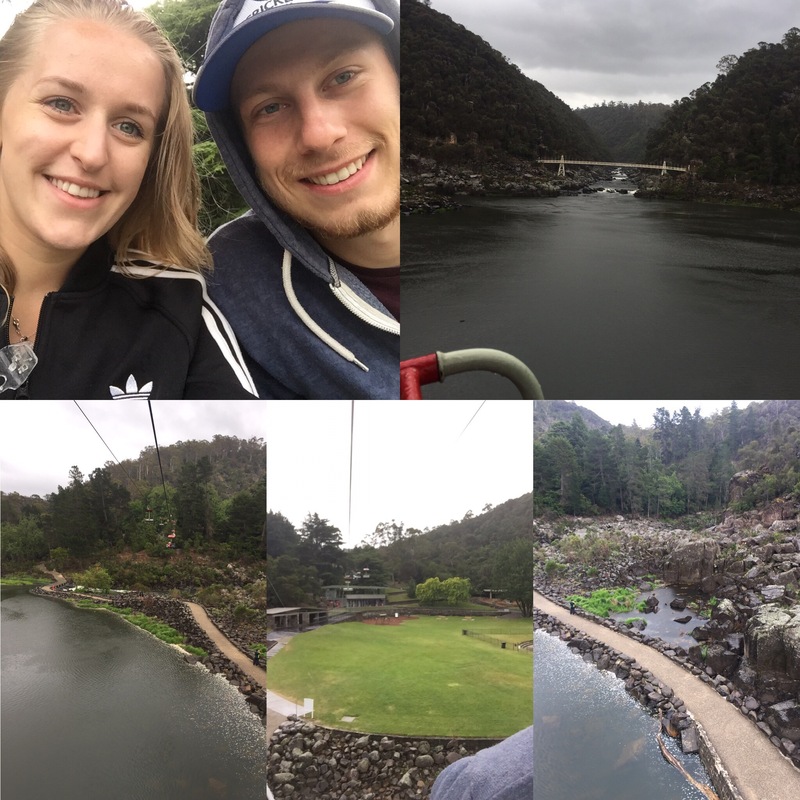 We didn’t let this stop us – when you have a finite number of days you can’t really afford to be delayed by the weather – and so we headed to the Cataract Gorge in Launceston. This is a big Gorge (as the name suggests) with big, green open spaces and a chair lift running through the centre giving very good views of the whole thing. 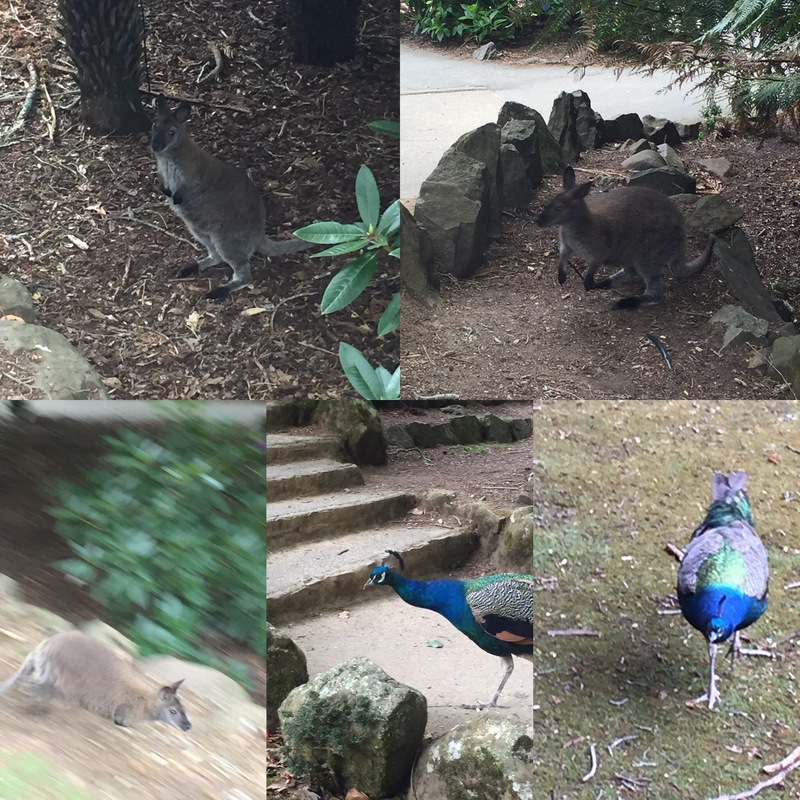 Something to always make us enjoy our day a bit more is wildlife and it wasn’t long until we saw a wallaby (I think we have an eye for them!) and there were also wild peacocks in the park. The rain wasn’t stopping us and, although I imagine it being a little prettier in the sun, the Gorge is still pretty cool. It’s enormous and there is a Suspension Bridge called the Alexandra which you can go across to get some good views of it all. As you’ll be able to see from the pictures, the main difference from a sunny day is that there aren’t blue skies and it’s not as bright but I imagine that’s the only difference (in appearance at least)! 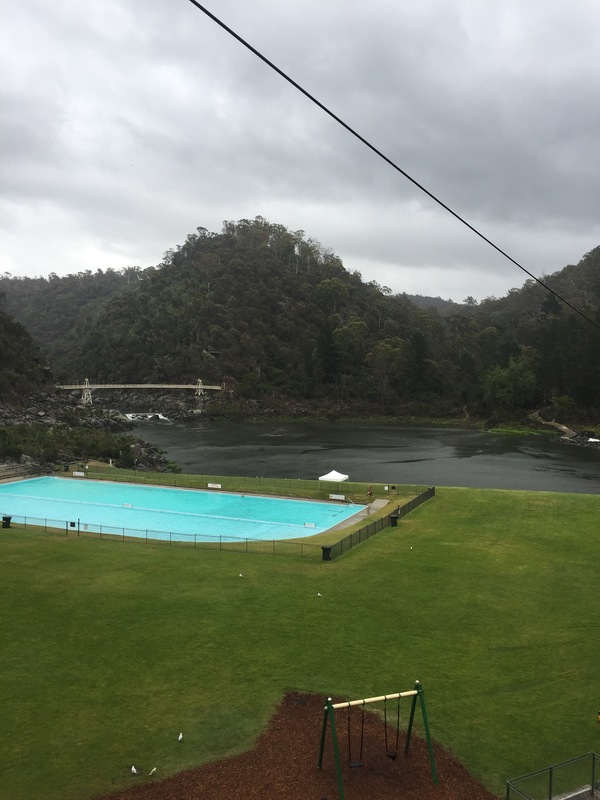 Something that would be nice on a sunny day (and something we would have exploited) is that there is a public pool along side the lake linked to the gorge. It really stuck out in it’s brilliant turquoise amongst the dark water but would have been an amazing setting for a swim. Someone was actually swimming there when we were visiting but I imagine it was really cold! After walking around the full site, we took the chair lift to get a birds eye view and this ended just a bit higher than where we parked. There was a little roof to the chair lift so, although we got wet in the rain, it didn’t matter and we could have been a lot wetter. The chairlift is 457 metres long and the central span of the lift is 308 metres which is believed to be the longest single chairlift span in the world – even so, it didn’t seem that long once you were up there. 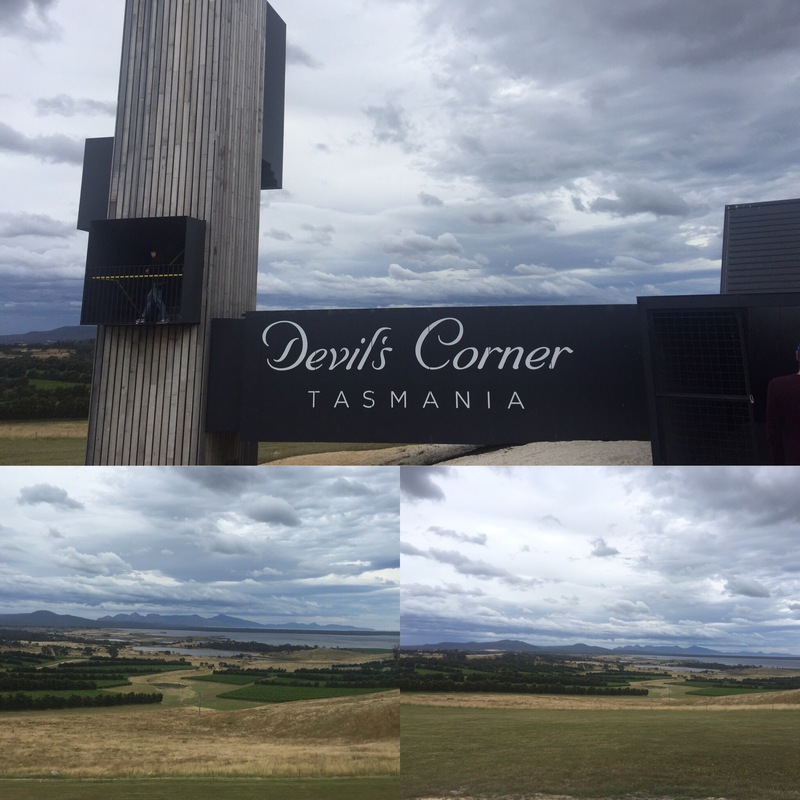 It was good to get to see the whole place in one view which you don’t really get from the ground. Our next stop was to the Lilydale Waterfalls – so it didn’t matter that we were wet and it was raining. We had to walk through some forest to get to it and the waterfall itself was in two tiers. After seeing the McKenzie Falls in the south west which was so big and powerful, a lot of other waterfalls have seemed so weak and insignificant – this being one of them. It was nice to walk through the forest and see it but, unfortunately, it was pretty underwelming. The most eventful part of seeing the waterfall was that a leech latched on to Niall, it was just a tiny one but still drew blood – we didn’t even know there were leeches here! This wouldn’t be somewhere I’d go out of your way to see if you were visiting. 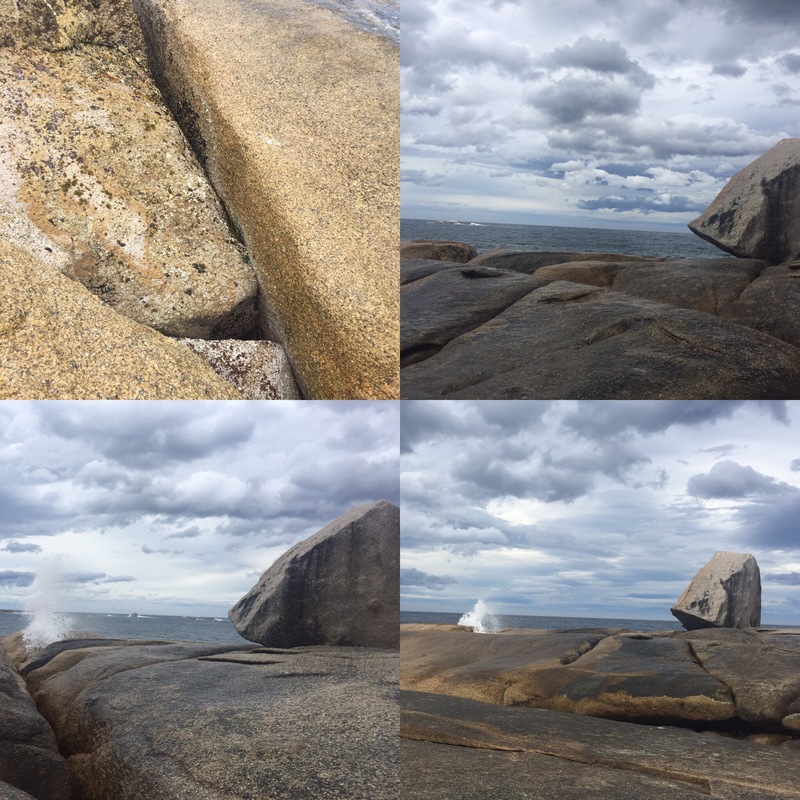 The final part of our day was spent at the blowhole at Bicheno. This is somewhere to go to if it’s in your area, we had a good time here. It’s worth allocating a bit of time for here as it can take a while to get a good spirt of water from the hole in the rock. 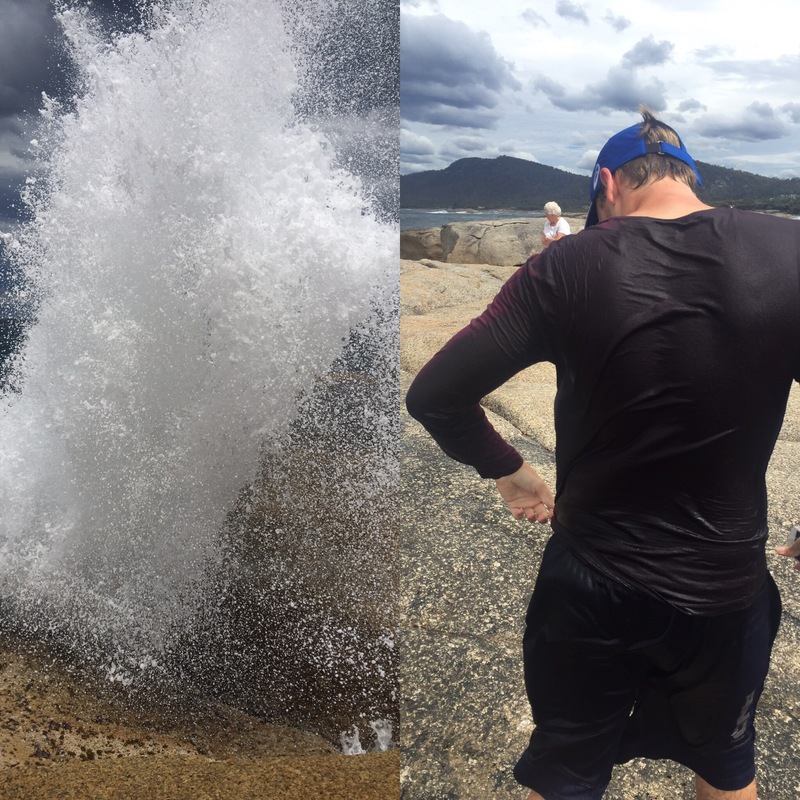 The funniest part of the day was when me and Niall had been standing near to the mouth of the blow hole to see what it looked like and then, concerned that he’d get splashed by the shooting water, Niall moved away from where we had been standing. In perfect timing, the biggest amount of water shot out of the blowhole absolutely drenching Niall whilst I remained bone dry. Unfortunately I didn’t get the moment on camera but did get the wave of water that hit him and a picture of him soaking wet to remember it by! Other people got wet from that shot of water and people get wet from other shots of water but none seemed to be as drenched as Niall was! Luckily for Niall we had our bags with us as we were staying in a different hostel that night so he was able to get changed out of his wet clothes. 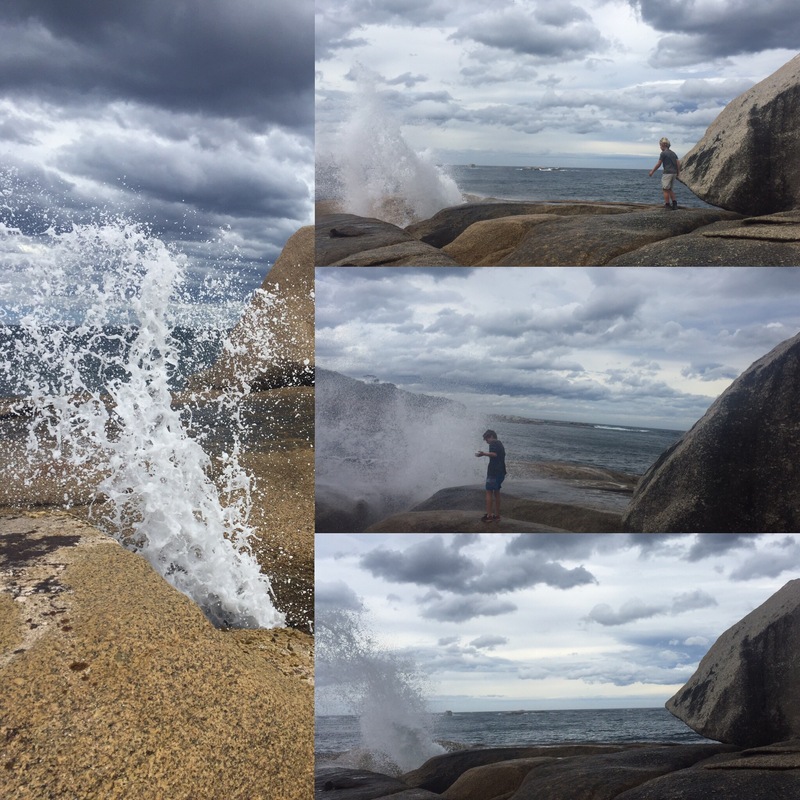 We stayed a little longer to see if we could get any more pictures of enormous shoots of water but the one that soaked Niall was the biggest of the day. It’s definitely not something I’ll forget in a hurry! 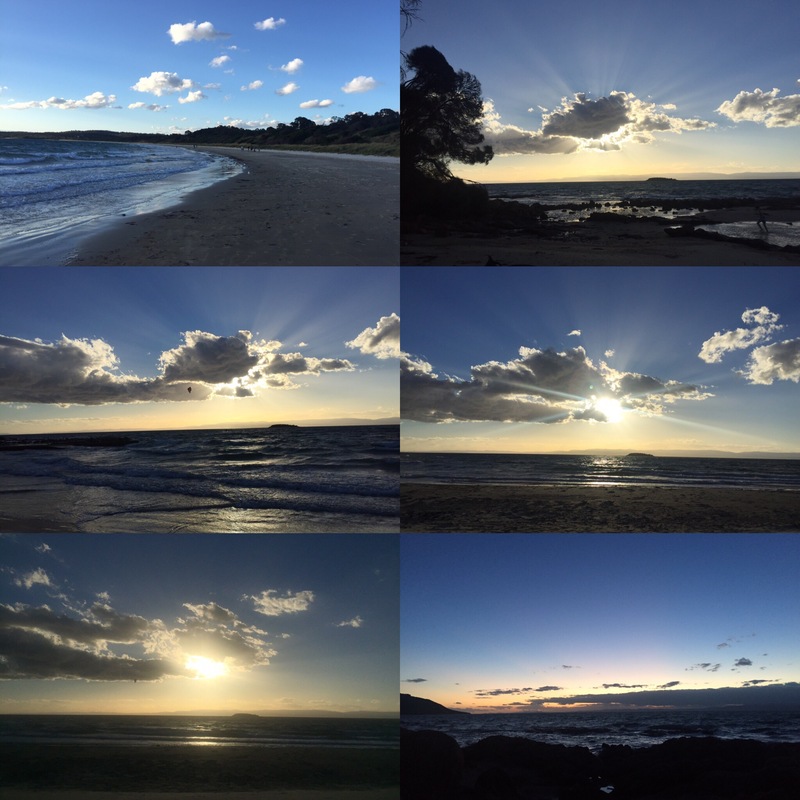 We ended the day at a little beach next to our hostel called Bream Bay where we watched the sun set.